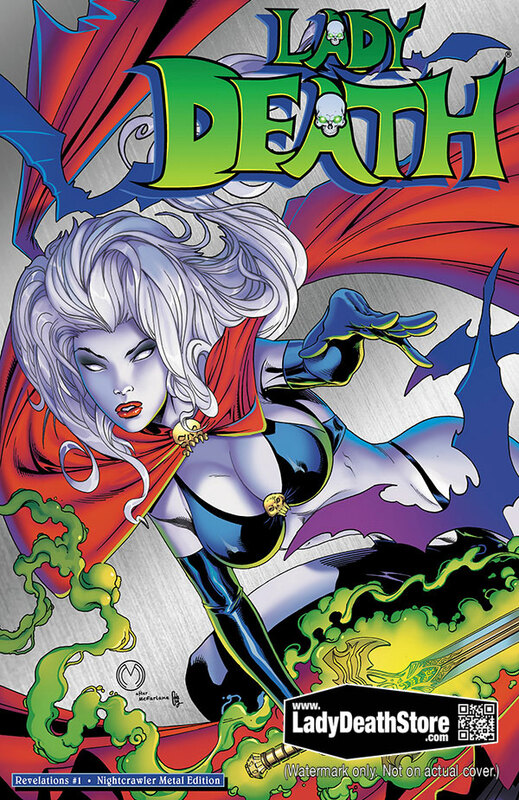 « LADY DEATH 24TH ANNIVERSARY & VALENTINES CELEBRATION! Why does being bad feel sooo good? Join us in the BAD BOY corner at Emerald City Comic Con 2018. You’ll be able to find us at Booth 944! Can’t make it to the show? No problem! 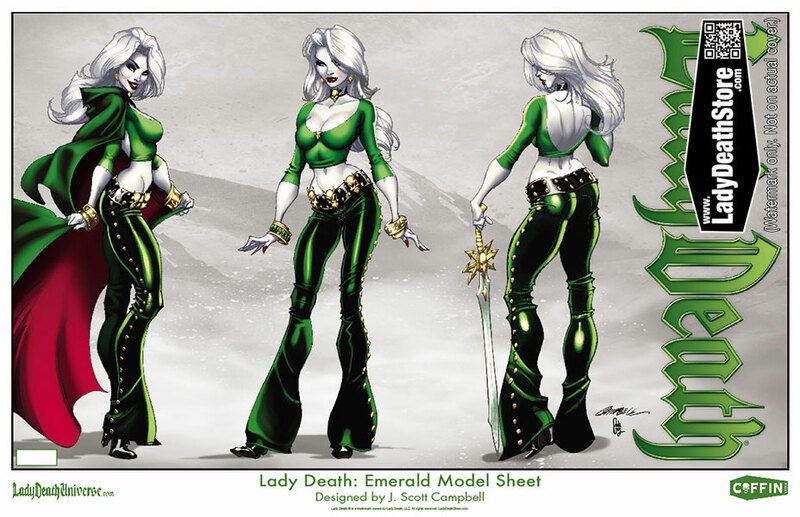 We’ll be going live with these ECCC exclusives at Lady Death Store starting Thursday, March 1 at 9:00AM Arizona Time! Full color, 24 pages. Limited to 250 serially numbered copies. 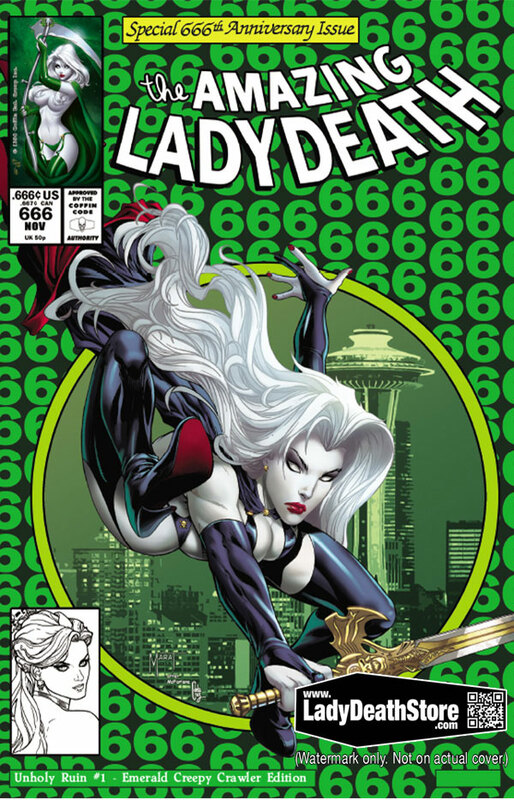 Strictly limited to one copy per customer, per household during ECCC! Full color, 24 pages. Limited to just 100 serially numbered copies! NOTE: Censor bar will not appear on actual product. Full color, 24 pages. METAL front cover enhanced with TONS of real Swarovski crystals! Limited to just 10 serially numbered copies and includes a custom METAL Certificate of Authenticity! Full color 11×17″ print on premium glossy stock. Limited to just 99 serially numbered prints! 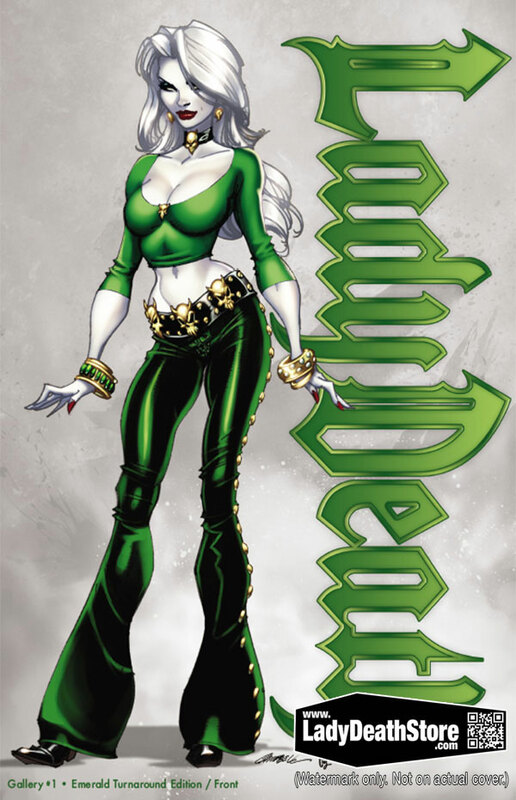 Full color 11×17″ model sheet on premium glossy stock. Limited to just 99 serially numbered pieces! 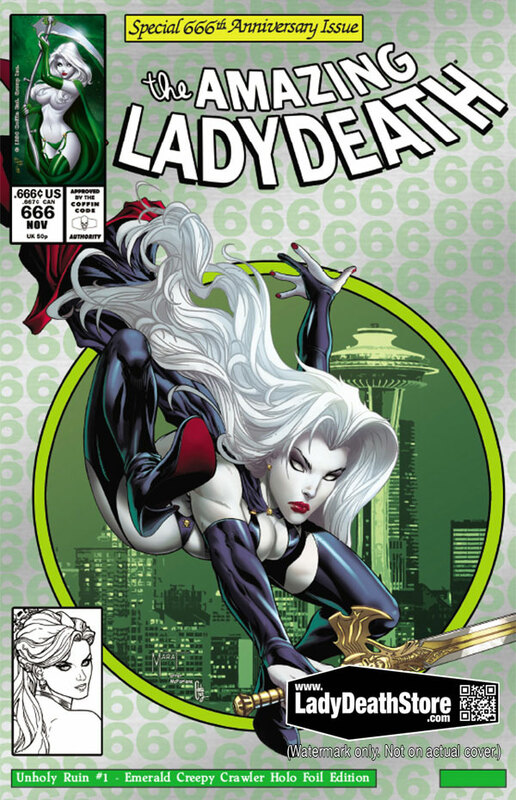 ONLY 10 DAYS LEFT TO BACK THE LADY DEATH: APOCALYPTIC ABYSS #1 KICKSTARTER! Last week, we proposed a challenge to everyone. Not only did you all accept this challenge, you OBLITERATED it! Thanks to everyone for helping push Apocalyptic Abyss into territory we’ve never been in before! $200,000 in pledges is no small feat and the fans have spoken! The OFFICIAL LADY DEATH CHALLENGE COIN is now unlocked and it will be shipped to all backers pledged towards a physically-shipping reward! Want to get in on this action? Click here to pledge to Apocalyptic Abyss! Create a Kickstarter account by clicking here. 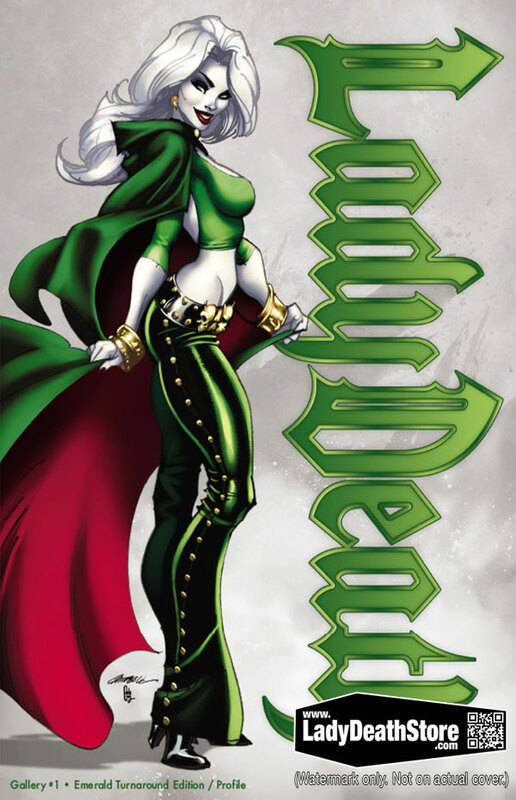 Search for the latest “Lady Death” campaign (Apocalyptic Abyss). Click the green “Back This Project” button on the campaign page or you can scroll down to preview the “reward tier” (items for sale). After you’ve selected your “reward tier” (items to buy), you’ll be prompted to enter in your payment information and select the appropriate info from the drop-down menus. Lastly, click the “Pledge” button and you’ll be all set! You will receive a confirmation email after completing your pledge. Also you can “add on” (purchase additional item) to any available pledge by sending us a direct message on Kickstarter. And remember: your card will not charged be until the campaign ends on Friday, March 9! 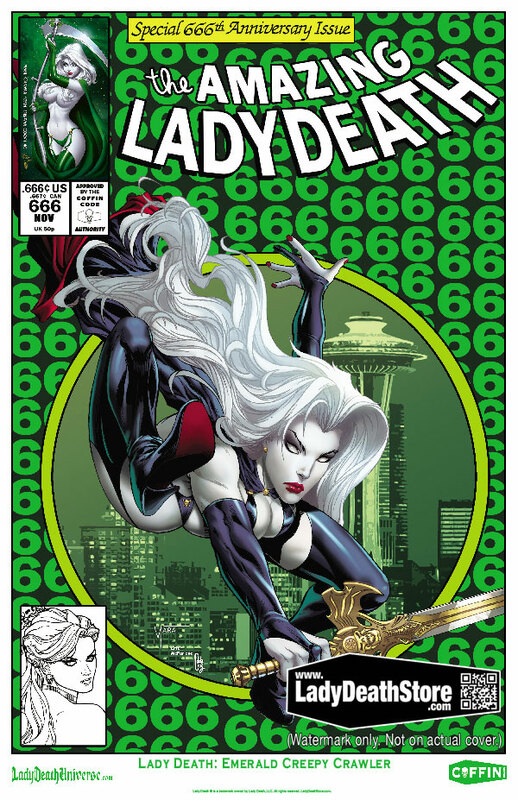 This entry was posted in Conventions, Kickstarter, Product News and tagged apocalyptic abyss, brian pulido, challenge coin, eccc, emerald city, emerald city comic con, exclusive, exclusives, kickstarter, lady death, offered again prints. Bookmark the permalink. Both comments and trackbacks are currently closed.